Short of going for dual GPUs and SLI, youre not going to find a faster gaming notebook. [+] Redline: Insanely fast; good build quality; overclockable; great features. [-] Meltdown: Insanely expensive; large and heavy; only 1080p (for now). For the past year, the fastest notebook GPU has been the GTX 980M. With AMD and Nvidia both stuck on the 28nm process node for 2015, most didn’t expect to see any significant changes until 2016. Shoehorning a mobile version of GM200 into a notebook seemed unlikely, as the 980M isn’t even using a fully enabled GM204, and yet it still runs into the 100W TDP limit of mobile GPUs. Faced with such an obstacle, Nvidia has decided to change the game and release a notebook version of the desktop GTX 980, using a fully enabled GM204 chip. They’re officially calling this the GTX 980 (since GTX 985M was apparently less marketable? ), which makes things a bit confusing as it’s not quite the same as the desktop GTX 980; we’ll refer to it as the GTX 980 for Notebooks for clarity as needed. How has this been accomplished? Simple: The TDP for the notebook GTX 980 is quite a bit higher than the previous 100W target; Nvidia won’t disclose precisely how much higher, but we estimate it’s in the 130W to 140W range. MSI is first out of the gate with GTX 980 in a notebook, with updated GT72S and GT80 models, but select Asus and Clevo-based notebooks will also support the new GPU. From MSI’s perspective, this is a new class of gaming notebook performance, and the GTX 980 is a $500 upgrade over the same notebook with GTX 980M. It’s not just about performance, however, as Nvidia is giving notebook vendors a lot of leeway in terms of what they do with the GPU; MSI takes their newfound freedom and runs with it. Sporting a multiplier unlocked Skylake i7-6820HK processor, MSI allows for BIOS overclocking of the CPU, and GPU overclocking via utilities like MSI Afterburner. The latter comes pre-installed, and on our test notebook the GTX 980 came from the factory with a modest 110MHz bump in core clocks. Even with a 230W AC adapter, the combination of CPU and GPU overclocking will push the power limits—we measured over 220W peak power draw during gaming tests, without overclocking the CPU, though PSU efficiency means there’s still another 50W or so before the system truly hits its theoretical limit. What this means in terms of actual specifications is a bit nebulous, as usual. Nvidia specifies the minimum (base) clock of the GTX 980 as 1064MHz, but GPU Boost is present and enabled. Running stock settings, the typical GPU clocks ranged from 1202MHz to 1228MHz, which means even without the +110MHz overclock the GPU is hitting about 140-160MHz above the base value. What happens with the +110MHz factory overclock? It’s not a direct increase, as GPU Boost is still in effect, but it does scale pretty closely. In testing, we saw clocks of 1300-1326MHz, so about 100MHz higher than the stock settings. Our zero-point notebook is an Alienware 14 with a 2.4GHz Intel Core i7-4700MQ, 16GB DDR3-1600, 256GB mSATA SSD, 750GB 5,400rpm HDD, GeForce GTX 765M, and Windows 7 Home Premium 64-bit. BioShock Infinite tested at 1920x1080 at Ultra DX11 settings; Metro: Last Light tested at 1920x1080 at DX11 medium quality settings with PhysX disabled. When it comes to gaming performance in a notebook, the GTX 980 is the new champion, and VRAM isn’t a problem either as most vendors will be using the 8GB model. 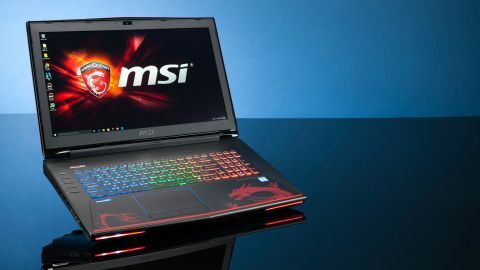 The GT72S smokes our zero-point laptop and leaves it smoldering on the ground, but even a high-end GTX 980M SLI rig like MSI’s GT80 will be hard pressed—the GT80 with SLI GTX 980M is only 10–20 percent faster in two of our graphics tests, but it actually trails by 12 percent in Metro: Last Light. The GT80 is also several pounds heavier and doesn’t have an IPS G-SYNC display, piling up the crispy peasant points for the GT72S. While the factory overclock on the GPU is nice, we can do better! Not content with the out-of-box performance, we set out to see how far we could push both the CPU and GPU with overclocking. We’re basically redlining the system at this point, and stability might not be totally there, but a 4GHz CPU clock with +220/300 GPU core/RAM was pretty close. (If you’re wondering, with GPU Boost the core clocks ranged from 1371-1410MHz, so we’re definitely running into the limit of overclocking.) The factory overclock netted a five percent increase in gaming performance, and with additional overclocking we’ve increased that to a 15 percent boost. Even against desktops like our GPU testbed, which uses an overclocked 4.2GHz i7-5930K, the GT72S can hold its own. Our desktop with a GTX 980 card posted average performance that’s only seven percent faster than the GT72S, albeit with the factory overclock. Perhaps more noteworthy is that with our maxed out overclock, the GT72S is faster than both the R9 Nano and a desktop GTX 980—though both of those could likewise be overclocked. But however you want to slice it, the GTX 980 in notebook form is definitely fast…perhaps too fast. You see those frame rates for the GT72S? Now consider the fact that the display is limited to 1080p with 75Hz refresh rates. At stock clocks, the GTX 980 for notebooks exceeds that threshold in four of our seven games, and with our additional overclocks we’re at the limits of the display in almost every game. What we’d really like to see is a higher resolution display. MSI says a 4K IPS panels will be coming out in the future, but that almost goes too far in the High DPI race as you’ll be forced to use Windows’ scaling outside of games. We’d still love to see a quality 1440p144 display in a gaming notebook, though perhaps that ship has already sailed. It’s not just a story of great performance, either. The GT72S is loaded with other extras like multi-colored backlighting, switchable graphics with five hours of video playback, a USB 3.1 Type-C connector for future-proofing, and a 75Hz G-SYNC enabled display all help to elevate the GT72S to truly lust-worthy status. It’s a true desktop replacement that you can drop into the included backpack for some intense gaming away from home. It’s also fairly easy to get at the internals, should you need to upgrade or replace any components (other than the GPU). The system can get moderately noisy under load (48dB from 18 inches away), but that’s actually better than some other gaming notebooks, and it also stays surprisingly cool. Above are several images we snapped of the GT72S under load, using an FLIR One infrared camera that FLIR was kind enough to provide. The hot spots under load can get above 45C, though most of the surfaces you’re likely to touch stay under 35C. Still, if you’re sensitive to heat, or live in a warm environment (our testing was done in a 22C ambient temperature), the upper-middle portion of the GT72S keyboard can get a bit toasty. And this is before additional overclocking, though to be fair that doesn’t affect temperatures as much as noise levels. One of the great things about the GT72S is that it’s not just for gaming—though the Dragon Army styling might look a bit out of place in a board room. This is a powerful notebook, no matter what you’re doing. Anyone that needs a portable PC for software development, video and image editing, running virtual machines, or other demanding work will be more than happy with the GT72S. Of course, most of those tasks don’t really need a beastly graphics card, but it’s there for off hours use. The keyboard and trackpad are comfortable to use and work well. Audio quality is also good, though nothing mind-blowing—this is still a notebook after all. This is the first of several announced systems with the new GTX 980 for Notebooks, and MSI sets the bar quite high. The only major drawback other than the price is the size. The GT72S isn’t the sort of system you want to lug around as a daily driver. While a higher resolution display might be nice, 1080p is still a comfortable resolution on a 17.3-inch display, and right now there’s no better option. (Wait until 2016 if you want a 4K 17.3-inch notebook.) For the target audience it doesn’t get much better than this. The only thing faster would be two GTX 980 cards in SLI, or wait for the next generation GPUs in 2016.